Get bags down the hill – it’s nearly as far as Glenfiddich Distillery, and set out for a day’s cycling without any specific events to get to. I’ve seen this Public Path to Aberlour signposted, though it’s not marked on my OS map. Not taking the advice I would give users of the Whisky Cyclist site, I don’t check out the Bing map, which has a larger scale OS map available (having looked at it now, the full path isn't marked there either). Getting down towards Glenallachie – pictures of Ben Rinnes to compare the snow cover to previous days, and of the distillery of course. To avoid the A95 as much as possible, I head through Milton of Edinville and the Benrinnes distillery, where I‘m rewarded with some pictures of the stills, as the shutters to the still room are raised today. I’ve decided to head down to the Speyside Way and take the path as far as Tamdhu, to see what’s going on there, and get pictures of Knockando with the bike in them. So it’s back past Dailuaine and Imperial beforehand. “Tamdhu” Station is the most intact of any on the former Speyside line. The quotes are because it was never called Tamdhu in its operational days – it was Knockando. It is however, right outside Tamdhu distillery and owned by the distillery, so the former owners renamed it – and used it as a visitor centre for a while. Although that use is long gone the buildings are intact and have been repainted - with the station signs being re-done in a font to match the new owners’ style. The distillery was re-launched during the festival with a fete on the Saturday, which I was unable to attend. They’ve produced a special bottle to commemorate the event - a 10yo ‘limited’ edition of 1,000 bottles selling at £100, matured in first fill sherry casks. The regular 10yo is a more reasonable £34.95, also sherry matured – the new distillery site says the regular bottle will be available in Waitrose. The only specialist site I’ve seen it on so far is Royal Mile Whiskies. While I was there the marquee that had presumably been used for the fete was being dismantled, and a large area close by had been cleared and some initial work was going on – for more warehouses(?) I’d not heard about plans for public opening, so I enquired at the General Office and was told that Saturday was a one-off. I’d forgotten some of the basic rules – asked for a cold Magners, my request was met with the lager’s cold – I settled for a half! (Last year I thought to ask for ice). But sitting outside in the sun – that’s why you go there, beautiful setting on the banks of the Fiddich (you may have guessed that from its name), just before it joins the Spey – if only the drink matched the location. There were three fishermen outside, who said they’d spotted me when I was by the Mash Tun, and we talked a bit about the Inn, but they were smokers, so I decided food at the Highlander was called for. Much busier than my previous visit on Wednesday. Dave (?) from Sunderland tells me he’s trying to match Duncan Elphick’s collection of all the Flora and Fauna bottlings. 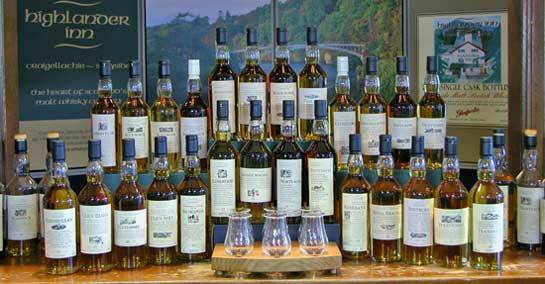 He’s got them all except the rarest four, which includes Speyburn and Royal Brackla. There were 26 altogether – many are no longer Diageo distilleries or have had their F&F bottlings superseded long ago and are therefore increasingly expensive and difficult to find. I didn’t take a picture of the Highlander collection, so this will have to do. Dave’s long-suffering partner, baby and dog were outside! After eating and enjoying a G&M cask strength Imperial (again) and a Signatory Clynelish – both bottled for foreign whisky clubs, I headed back towards the Fiddichside, but the sun was too low, so straight back to Dufftown – to B&B, I don’t have to go all the way up the hill! Downside to that comes next when I realise that the Royal Oak is no longer within (what I regard) as walking distance. Despite the Festival being over, there are still plenty of whisky lovers to talk to – some including a group of Germans have only just arrived in Dufftown. Time for a not too late night.